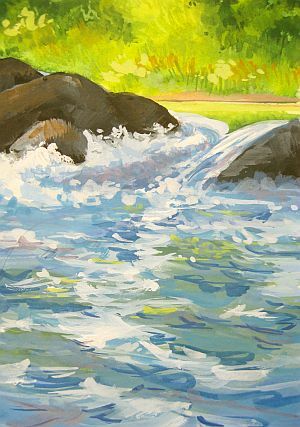 Years ago I visited the Blanco Basin up near Pagosa Springs and took the photo that inspired this little painting. 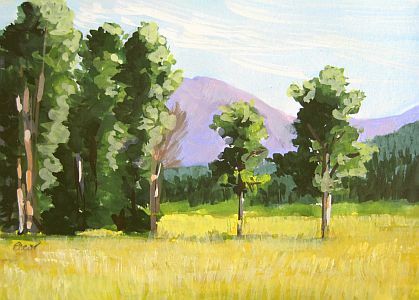 It was a ripe summer day, clear blue sky, looming mountains, with wide fields through which the road meandered. I think it's the relationship of the trees, like a family admiring a youngster, that appeals to me. They all stand at the same distance, as if they're posing for the photo. I like that. I probably should have come up with some clever title relating to it... Meanwhile, I hope you enjoy a family moment in the midst of a summer day. Have you ever sat beside a deep brook flowing swiftly downstream? It's a treat to the ear and the eye. That's why I call this one Gurgle and Sparkle. I enjoyed sorting out the choppy water, the spray from the little waterfall, and painting the rocks, but the green and purple reflections were the most fun. I hope you can hear that lively sound when you view this one! My usual little size, 3.5" x 2.5", on Bristol paper. As much as I want spring and summer weather, it's really still pretty cool and gloomy around here. Sometimes it's necessary to find the beauty that surrounds you, instead of pining away for what has been or will be. This painting is a means of stopping to 'smell the roses', as it were. There are times when the sweep of a hillside cloaked in winter chamisa can be breathtakingly beautiful. I recall once, back in about 1989 or so, I was driving Albert Handell to a workshop in Albuquerque. The day was wet and gloomy. It was still winter, likely about this time of year--February or March. As we drove down a street filled with older adobe style houses a shaft of morning sun filtered through the gloom and we both looked at the incredible colors. It was a moment of mutual, mute understanding that's stayed with me all these years. The glory of winter's beauty was underlined by the moment of appreciation we shared. The subtle beauty of dry foliage, clinging to the faint memory of dead greens, yellows and rusts, punctuated by deep, dark golds, browns and grays still thrills me. 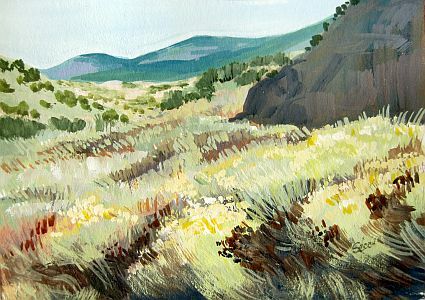 I love the colors of the rock in shadow, echoing those same hues in a darker tone, and the rolling hills in sunlight, reaching back tot he mountains in the distance. So I guess today it's a matter of expressing appreciation for what is, and seeing the beauty of today. 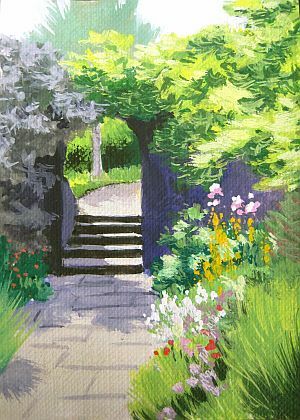 The photograph I used is from a WC acquaintance, Lin, who shared it on the Gouache Corner. I've taken some liberties with it, cropping and rearranging things. The stairway and path are inevitably the area of interest. I think the flowers on the right effectively balance it, especially since the shadow links the two sides visually. It's painted on a piece of Canvas Paper, giving some nice textural notes. I like the way the distant foliage under the arch looks, and the walkway and wall use this texture well, too. All in all, this is a very satisfying painting to me right now. It's nudging into spring. The plum trees are budding, dark eyelids still demurely cast down over rich pink flowers. I'm so ready for winter to be over. This painting must give you a hint of the mood I'm in. 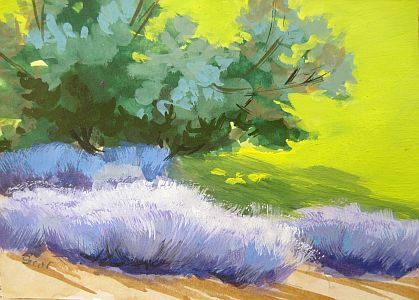 I want lush green grass, olive trees swaying in the breeze, and the indigo broom bursting with tiny lavender flowers. Soon... Meanwhile this lively color scheme feeds my soul.